f.16 'Sevandroog.' Inside the fort. bl.uk > Online Gallery Home	> Online exhibitions	> Asia, Pacific and Africa Collections	> f.16 'Sevandroog.' Inside the fort. 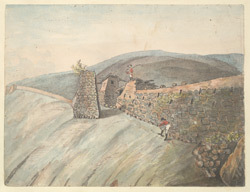 Pen-and-ink and water-colour drawing of the fortress of Savandurga by James Tillyer Blunt (1765-1834) between 1788 and 1800. Blunt was employed on survey work with the Bengal Engineers from 1783 to 1810. This is one of 31 drawings (29 folios) of landscapes in Delhi, Uttar Pradesh, Bihar, Orissa, Madras and Mysore taken between 1788 and 1800. Savandurga, in southern India, is made up of two granite cliffs, c. 4000 feet tall and 13 kilometres (8 miles) in circumference. The darker one is called Karigudda or the black hill and the other Billigudda or the white hill. The hill fort on the top of the outcrop was erected in 1543 by Samanta Raya. It then came to Immadi Kempe Gowda of Bangalore until 1728 when it was captured by the Raja of Mysore from whom it passed to Haider Ali. In 1791 Savandurga was taken by British forces under Cornwallis.